Our journey following the footsteps of Polish filmmakers, that we have started during the 9th season of the Polish Cinema for Beginners, is coming to an end. After visiting France (“Danton”), Sweden (“Strange Heaven”), USA (“Gospel according to Harry”) and Portugal (“Imagine”), at the last screening we will take you to Great Britain. 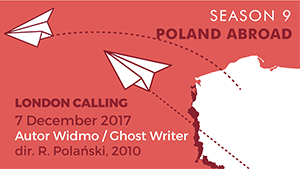 On the 7th December we are inviting you to the New Horizons Cinema to see Roman Polanski’s “Ghost Writer”. Made with a star cast, Roman Polanski’s eighteenth feature-length film takes up the director’s favorite theme of entrapment. This time, the author of the Rosemary’s Baby is telling the story of a writer (Ewan McGregor) who is commissioned to write a book about the memoirs of Adam Lang (Pierce Brosnan), a former British Prime Minister, clearly modelled on Tony Blair. It turns out that his predecessor died in unexplained circumstances, and the eponymous ghost writer has to work under intense pressure of not only Lang, his wife (Olivia Williams) and assistant (Kim Cattrall), but also the press and the secret services. The insight into the dark backdrop of power makes the writer’s work increasingly dangerous. The atmosphere becomes dense and the tension, as in a thriller it should, reaches the zenith. Based on Robert Harris’s book The Ghost Writer won six European Film Awards (including one for the best film) and brought Polański The Silver Bear award for the best director at the Berlin Film Festival. Organized since 2012, the Polish Cinema for Beginners is the first Polish film programme addressed so directly to foreign-language audiences, who often did not have the opportunity to meet the greatest masterpieces of Polish cinematography, but also the cult classics of our pop culture. Polish Cinema for Beginners screenings are always preceded by an expert’s introduction, presenting the subject matter and context of the film, and summarized by a discussion during which the viewers can dispel doubts or simply talk about what they saw on the screen and whether it appealed to them or not. The 9th edition of the award-winning Polish Film Institute’s project, called “Poland Abroad”, presents 5 films that are arranged as a journey along the paths of Polish cinema all over the world. From Wajda to Polanski, we take a look at how Polish filmmakers find themselves in the international cinematography and how do they describe the world out there. . The screening of the “Ghost Writer” will take place on the 7th of December at 8 pm in the New Horizons Cinema. Tickets can be purchased before the screenings at the ticket offices and at KinoNH.pl website. More information about the project can be found at: PolishCinema.com.pl and facebook.com/PolishCinema. You are invited to the Polish Cinema for Beginners by the Wrocław Film Foundation. See you at the cinema!